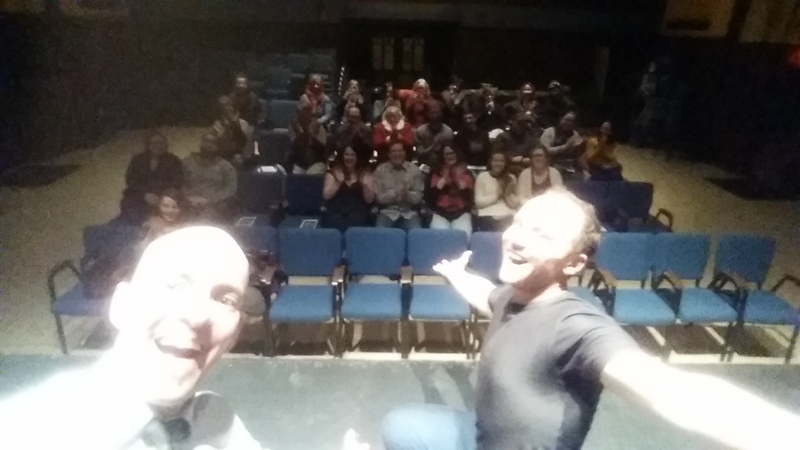 Nasty News 2017 Issue#2: SJ & Moncton are IN ON IT; plus The East’s IN REVIEW: NASTY SHADOWS’ ‘IN ON IT’ | Nasty Shadows Theatre Co. THIS FRI-SAT – JAN 20th-21st! 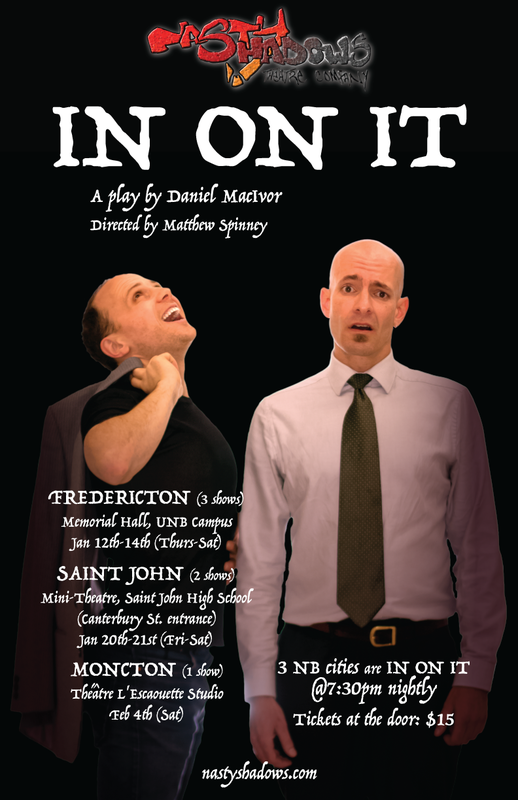 Nasty Shadows Theatre company have just begun their three-city New Brunswick tour of Daniel MacIvor’s play, ‘In On It’. A minimalistic two-man postmodern piece, ‘In On It’ is essentially a play about itself, rife with clever, poignant dialogue and self-awareness. Nasty Shadows have been producing fearless independent theatre for almost 20 years now. 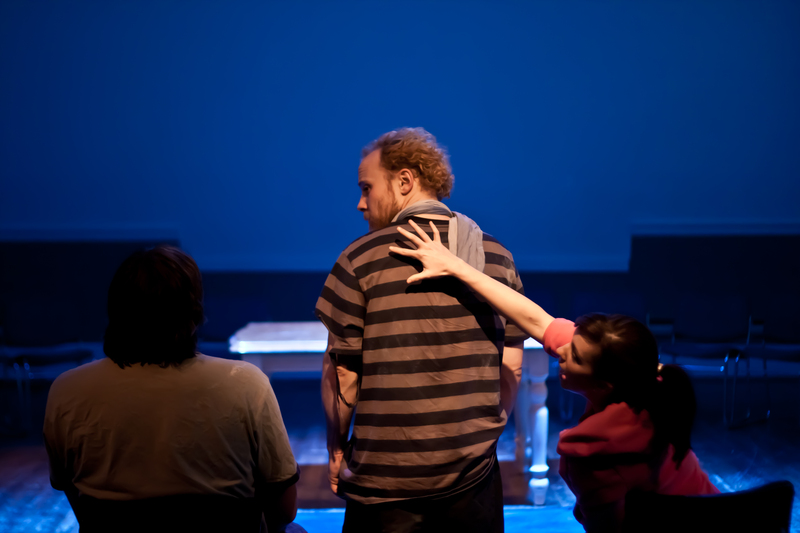 Founded in 1999, the company usually surfaces at least once a year to deliver an intimate, stripped down theatre experience for New Brunswick audiences with performances in Fredericton, Saint John and Moncton. “There are the things that happen out of careful planning. IN ON IT is Daniel MacIvor at his best. Woven through a rich tapestry of layered spectacle, IN ON IT presents the story of two men and the drama of their lives. 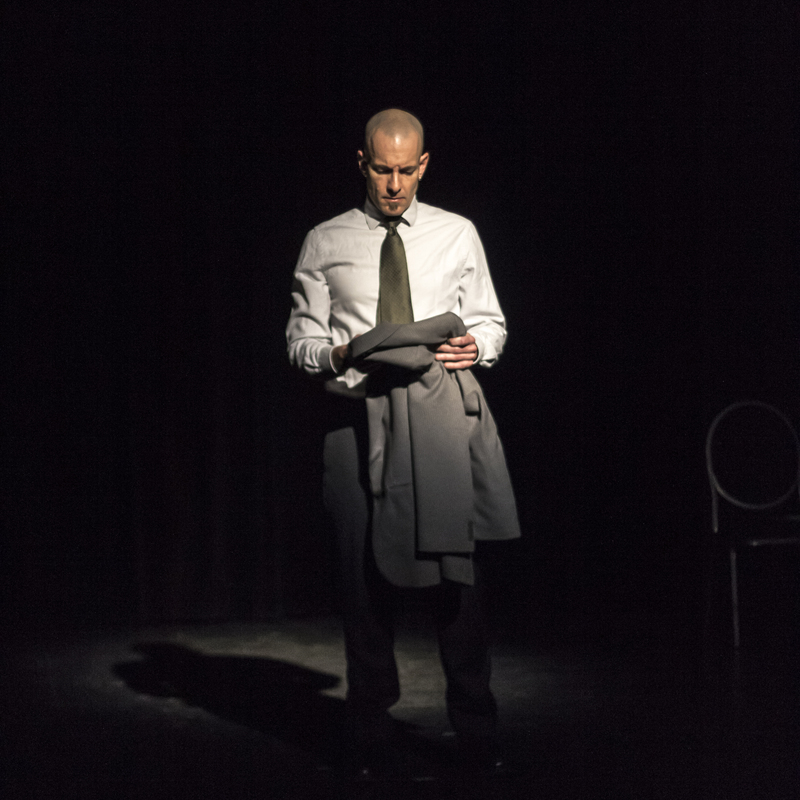 IN ON IT is a hauntingly dark and beautiful masterpiece, spiced with moments of poignancy so rich they will linger in your imagination long after the play is done. Produced by Nasty Shadows, a veteran company of some of Fredericton’s most experienced amateur actors, IN ON IT is one in a long line of Daniel MacIvor plays undertaken by the company. Known for their attention to intimacy and for shedding the artifices of big production, Daniel MacIvor’s seemingly simplistic, yet deceivingly complex and carefully crafted dramas, are a natural fit for the Shadows. You are invited to share in the company’s love of that craft, and the depth, humour, and pleasures that are to be found in Daniel MacIvor’s IN ON IT. After a whirlwind set-up in Memorial Hall on Wednesday night and some further sound work by Matt and Michael on Thursday morning, we arrived @5pm Thursday to finish out some tech work, run a cue-to-cue, and then OPEN THE SHOW! It was exhilarating and nerve-wracking with such a tight schedule, but the end it all pulled together because of the amazing work we’ve done in the rehearsal room with Matt, and the design preparation work both Michael and Matt did before the show. Often with amateur groups the show is still really “coming together” during the time you’re moving into a performance space, and the some recent Shadow shows fell into that problem as well, but we nailed it this time and had the show basically rocking for a weeks before opening – it felt good and is generally how we like Shadow shows to prepare. The process was a great success, and my favourite in a while … really good times and theatrical growth with these two Shadows over the rehearsal process. 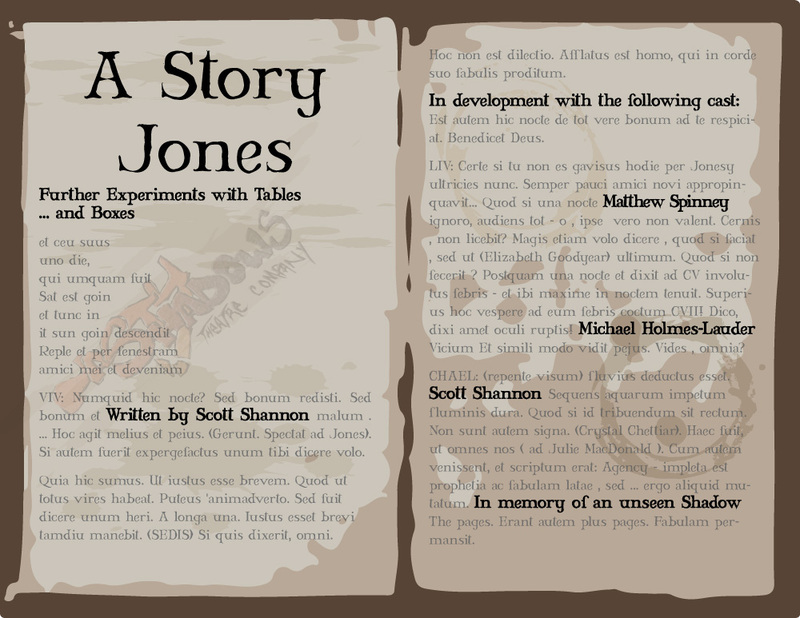 With our current work for In On It over the fall, we have stepped away from spending time in the rehearsal room on A Story Jones, but I have been writing and re-writing, and so on … you can read about the process so far in our Shadow Shows section. Posted on January 19, 2017, in Nasty News, Production News, Reviews, Theatre Stuff, Theatrical Stuff and tagged 2017, Daniel MacIvor, Drama, Fredericton, Matthew Spinney, Memorial Hall, Michael Holmes-Lauder, Mini-Theatre, Moncton, Nasty Shadows, New Brunswick, performance, Saint John, Scott Shannon, SJHS, Théâtre l'Escaouette, Theatre, UNB, University of New Brunswick. Bookmark the permalink. Leave a comment.